Howdy! I shared my pink version of this card, in an earlier post today. But, now I want to share the green version with you! As I said earlier, I need to make 16 cards, to say 'Thank You' to various folks who help support the North Valley Academy PTO, and variety is the spice of life. Right? I stopped by Mojo Monday to see their current sketch. And I have to say, it's pretty exciting! The possibilities are truly endless. You can use either rectangles to showcase pattern papers, embossed papers, text papers, emphoria, and so much more. 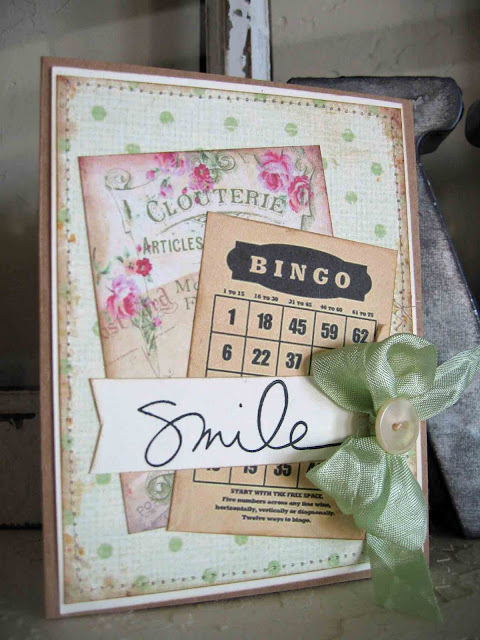 I am also entering this card in another card challenge: Word Art Wednesday. Their challenges are: Anything Goes & Family Friendly. So, how can you say no to that? The design team will certainly inspire you! Recipe: I used my favorite kraft card stock for the card base. I just love this card stock. The color, the feel, the ease of work. Everything of it! I added a matt of very vanilla card stock, by Stampin' Up! to give my main piece some contrast. I used digital papers, for all of my pattern papers. I distressed the edges of all the papers with tea stain ink. I adhered the pink floral paper onto the very vanilla card stock, and then added a machine stitch border. 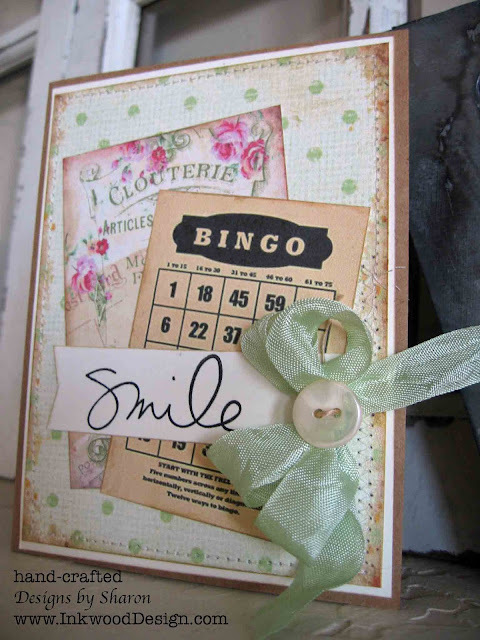 I layered a floral tag and a bingo card off center, and angled in two different orientations. I hand stamped the sentiment for my horizontal piece. I used a very old stamp set by Technique Tuesday. I added a banner edge to give the sentiment some visual interest. I replaced the circle element with a multi-loop bow. I tied a vintage kraft button, using kraft twine to the bow. Viola! Not a 10 minute card, but not too incredibly daunting to make over a dozen cards. And yes, I made a green version and a blue version. Variety is the spice of life, right? Another beautiful take on the sketch! Love the pink and green together, such romantic paper choices.